For those who can remember that far back, Chris Young was the key “low-risk, high-reward” signing the thrifty Mets made last winter. Oodles of beat writers, bloggers, and fans couldn’t praise the move enough. After all, when healthy, Chris Young was an outstanding pitcher — a legitimate #2 starter on a championship club. Young would top a rotation that included the surprising R.A. Dickey, the improving Mike Pelfrey, and the poised-for-breakout-season Jonathon Niese. Further, that formidable foursome would be led by superstar Johan Santana, who was sure to be joining the team by June — or the All-Star Break, at the latest. That dream went down the drain in early May, when it was clear Chris Young would not stay healthy any longer than it took milk to turn sour. Oh, sure, Young was very good — great, in fact — but only through four starts and 24 innings. You can say that it was a managed-risk gamble, and the fact they got anything at all out of Young was worth that risk. I’m not sure I agree, because once Young made it through training and appeared healthy, he became an integral part of the Mets’ plan — a plan that was also predicated on the expected return of Johan Santana. Just curious: does that kind of planning — relying on hopes and wishes specifically — remind you of anything? Hmm … maybe the same strategy employed by the last front office regime? The more things change, the more they stay the same; the only difference was that last winter, the strategy was celebrated because the Mets spent less money. And as a fan, that’s exactly what I want to see: my team spending less money to lose, right? Anyway … not much to say about Young’s abbreviated season. He accomplished what was predicted here, and provided Mets fans a very brief, but fun, period of optimism. One bright side: by going down, Young opened up an opportunity for Dillon Gee, who took full advantage. Chris Young expressed interest in re-signing with the Mets, but I doubt the cash-strapped team will pay him to rehab. Young will not be ready to pitch in MLB in 2012, and whether he can return in 2013 — by which time, he’ll be 34 years old — is questionable. Complicating his return is the fact his horrendous pitching mechanics directly contributed to his shoulder injury. Chances are, Young won’t adjust his mechanics, so once he resumes throwing, he’ll continue to aggravate the parts of his shoulder that were surgically repaired. And/or, he’ll return for a short while, then re-injure his shoulder. No matter which way you look at it, Chris Young’s future as a Major League pitcher is dim. This was not a low risk sign. A low risk high reward guy is when you give one of these guys a minor league deal or a deal to be long man or last guy off the bench. But when you sign an injury ravaged guy like him to be one of your starters it is high risk. High risk because you are risking your season on his health. It may low risk to the horrid owner who can’t fix his finances but to anyone who cares about winning its high risk. The first sentence sums it up I literally had no idea who you were talking about for a minute or so. Is this the front office protocol we can look forward to? Omar threw dollars at 40yr + guys who had played for the Expos, and Sandy just goes for guys with their arms hanging off. Time to get promoting from within and admit it’s a rebuild. Well, at least pretend there’s a solid plan. The Mets got two starters for a few million, Young given an incentive laden contract that would give him a few more, but underlining the management knew he was an injury waiting to happen. The injury came. The Mets got a month out of him. Pro rata, that amounts to 6M a year. I recall various articles myself that thought it was fairly likely only one of the starters would start. 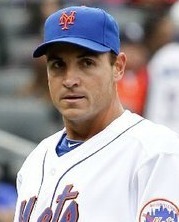 Capauno served as a reliable fifth starter. Perfectly fine in that role and would be on any number of teams. Gee filled in for Young. Gave the team some more months of good starting. Santana didn’t come back. If the Mets wanted to, they could have picked up someone mid-season. They didn’t. They were in saving money mode. Young/Gee and Capauno & co. gave the fans some decent baseball. If Pelfrey pitched better, it would have been even better. The season was lost when Beltran, K-Rod was traded and then Murphy/Reyes was hurt. The season was a low expectations sort of thing. The cut rate salaries was better proof in advertising there than overpaying Bay or some other person to show the team is serious about winning. The cheap signings and the on the cheap bullpen made it clear — like it or not — ’11 was not a year to hope for the stars. Didn’t think Young would be some “integral” part of anything myself. I think cheap seats (and some free for special groups such as some senior citizen group on a budget etc.) is perfectly fine, especially if the alternative are empty seats. But, Chris Young was still not a high risk gamble. Putz, an expense back-up closer who didn’t play, was. The team didn’t gamble last year. They aimed low. Be as bothered as you want about that. A one size fit all scorn fest isn’t always appropriate all the same. 1. What man says “oodles”? 2. Beat writers covering the Mets were also high on the Mets signing John Lackey and Ben Sheets, so why reference them at all? 3. The Mets were very clear and straightforward in stating that Santana should not be counted on in ’11. No Met fan I know had any expectation that Johann would be in the rotation. 4, To sum up, the Mets have had enough real misfortune to deal with without a nobody like Joe Janish imagining things that aren’t true and then breathlessly gushing about them..
1. It was written, not spoken. Is “breathlessly gushing” something lifted from recent reading? 3. The possibility of a June (initially) return was constantly dangled to keep fandom hopeful. Not all Met fans are as hopeless as you appear to be. 4. Since you are obviously a fellow nobody, what somebody gave you the right to bash another for irritating your unbending sympathy for self inflicted mediocrity? 1. “oodles” is a word to be used only by men who are man enough to use it. 2. True. Why reference anyone, ever? And toward that end, why are you referencing me? 3. Thank you, I enjoy reading revisionist history. 4. Why do the Mets have to “deal” with me? Especially if I’m a “nobody”? One of the reasons I like this blog is that we can express opinions and differences without personal insults. we keep them on an somewhat adult level (at least as adult as we can be as Mets fans). Let’s face it, we are frustrated and sometimes angry. Express those thoughts and leave the personal invective at the door.